HD screencaptures from the very first episode of BBC One’s ‘War and Peace’ have been added to the gallery! Lily plays Natasha Rostova and the second episode will air Sunday evening. Portraits of Lily and the cast of ‘War and Peace’ taken during the TCA Winter Press Tour have now been added to the gallery. Lily looks elegant and beautiful, be sure to check them! USA TODAY – Eight hours might seem enough time for a film presentation of a novel, but we’re talking Leo Tolstoy’s classic, War and Peace. “I don’t feel like any major plot points are missing,” director Tom Harper told writers Wednesday at the Television Critics Association winter press tour. The four-part miniseries.to be simulcast on A&E, History and Lifetime (Jan. 18, 9 p.m. ET/PT), is set against the backdrop of Napoleon’s 1812 invasion of Russia, focusing on the fortunes of five aristocratic families in the fading days of imperial Russia. James Norton (Grantchester, Rush) plays Andrei Bolkonsky, whose disillusionment about war may be cured by Natasha Rostov (Lily James), who needs to marry to keep her family from financial ruin. Pierre Bezukhov (Paul Dano) has great wealth, but is at the mercy of fortune hunters trying to prey on his naiveté. Viewers will get to see “amazing” scenes, from battleground to ballroom, but “it’s the intimate emotional moments that make the story quite so wonderful,” Harper said. Executive producer Harvey Weinstein said a librarian neighbor introduced him to the novel after a youthful injury playing Cowboys & Indians kept him from attending school. “It’s my favorite novel,” he said. The production is faithful to the novel, Weinstein said. “What I think this series will do is get people to read the book,” said Weinstein, who has had a similar experience with feature film productions. Dano (Love & Mercy, 12 Years a Slave) finds Tolstoy’s story relevant today. 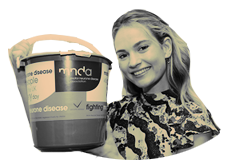 James (Cinderella, Downton Abbey) said she’s long been a fan of period dramas and was “blown away” as a youngster watching Kate Winslet in Titanic. She was drawn to Natasha’s “vast” journey, which she described as “intoxicating,” and praised Tolstoy’s writing skill. “I fell in love with Natasha when I read the book. I didn’t understand how Tolstoy could understand a 13-year-old girl like that,” she said. 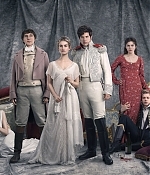 Even More War and Peace Promotional Images Added! Additional HQ promotional images from War and Peace have been added to the gallery, thanks to Far Far Away. Be sure to check them and enjoy! 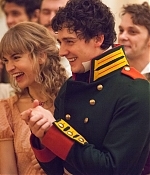 Thanks to Far Far Away, we’ve added three new beautiful promotional pictures of Lily as Natasha Rostova in War and Peace. Be sure to check them in our gallery!